Chef Mark Anderson is culinary director with burgeoning Irish corporate caterers, Gather & Gather. He’s part of a process which, every day, delivers more than 5000 meals to workers in the city of Dublin alone. Yet, he believes that scale has no bearing when it comes to ethics and the guiding principles that essentially decide how a chef and his staff approach the sourcing and preparation of their menus. There’s no reason, he says, that Gather & Gather kitchens can’t be just as concerned about issues such as work/life balance, provenance and food waste as the staff at a small, high-end eatery anywhere in the country. Speaking to LCN this month, Dublin-born Anderson (48), recalled attending a symposium by renowned Irish chef, JP McMahon called ‘Food on the edge’. Ownership, he contends, is the key to fostering a successful kitchen culture. When you take accountability, he says, you are demonstrating to everyone your willingness to engage with the values that you expect others to live up to. In an exercise with a client some years ago, Mark asked people at every level in the kitchen to supply 10 aspirational words which, for them, described what a kitchen should be. Then, he and his executive chef picked their top 10 and these words were framed and mounted in the kitchen. They became an agreed mission statement to which everyone that worked there could subscribe. Mark Anderson has been in hospitality all his life. After attending catering college in Dublin he embarked on seven or eight years of travel in a bid to garner experience and ‘see what was out there’. After stints in a variety of kitchens in the US, Scotland and England, he returned to Ireland in 1998 and almost immediately, took a position as sous chef at the Herbert Park hotel in Ballsbridge. Ownership is key to fostering a successful kitchen culture, says Anderson. Pictured here, Gather & Gather staff at Primark in Ireland. Gather & Gather currently works at around 270 sites in the UK and Ireland and like everyone in the modern foodservice environment, they deal daily with issues such as work/life balance, the need for increased sustainability in the kitchen and, of course, a widespread shortage of skilled labour. Anderson knows that when it comes to establishing a kitchen culture, issues such as sustainability can’t be ignored. Food waste has become a major issue for chefs at all levels and commercial cooking isn’t an exact science, so no matter how experienced a chef is, he or she can’t know how much food will find its way back into their kitchen. According to Anderson, a holistic approach is necessary. Chefs don’t just need to know what is potentially being wasted and how much of it there is, they also need to have a logical and sustainable approach to dealing with that food once it’s back in the kitchen. ‘You might tell me that you have no wastage in your kitchen, but show me what you’re actually doing with your left-over food,’ says Anderson. Also, Gather & Gather grows many of its own herbs in a rooftop garden and it sources fresh vegetables from a charity in Dublin, paying market rates for the produce. All of that comes back directly to kitchen culture, says Anderson. 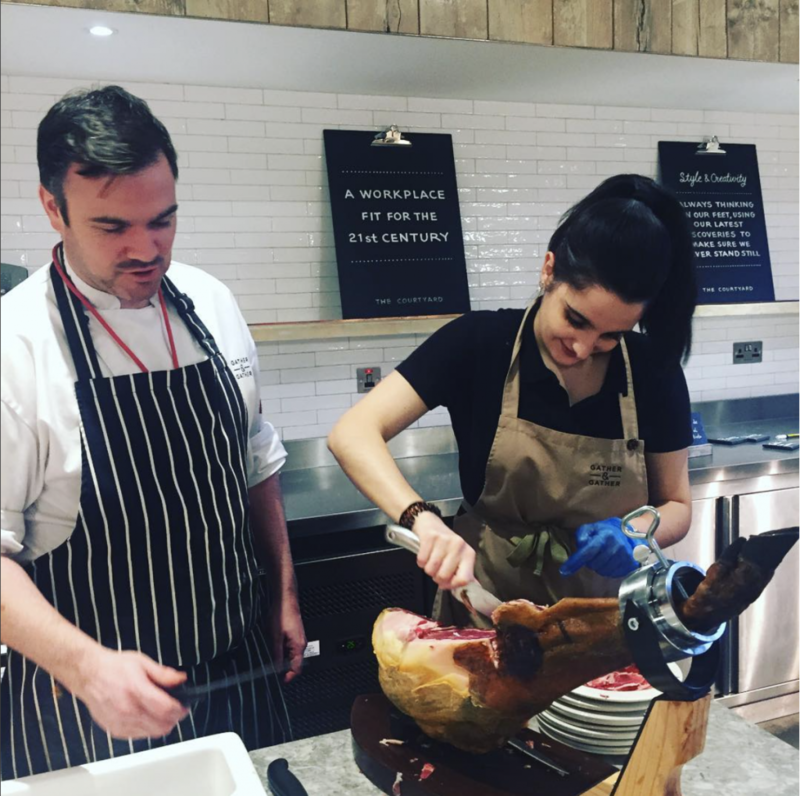 Gather & Gather wants to be able to attract chefs from the best kitchens in the country and to do that, it needs to break the mould around popular perceptions of corporate catering. ‘It’s a challenge,’ agrees Anderson. ‘How do we get these talented people to come and work in the catering industry in Ireland? One of the other things that we do is, we offer them full creativity. They write all their own menus, we don’t issue them with centralised menus. 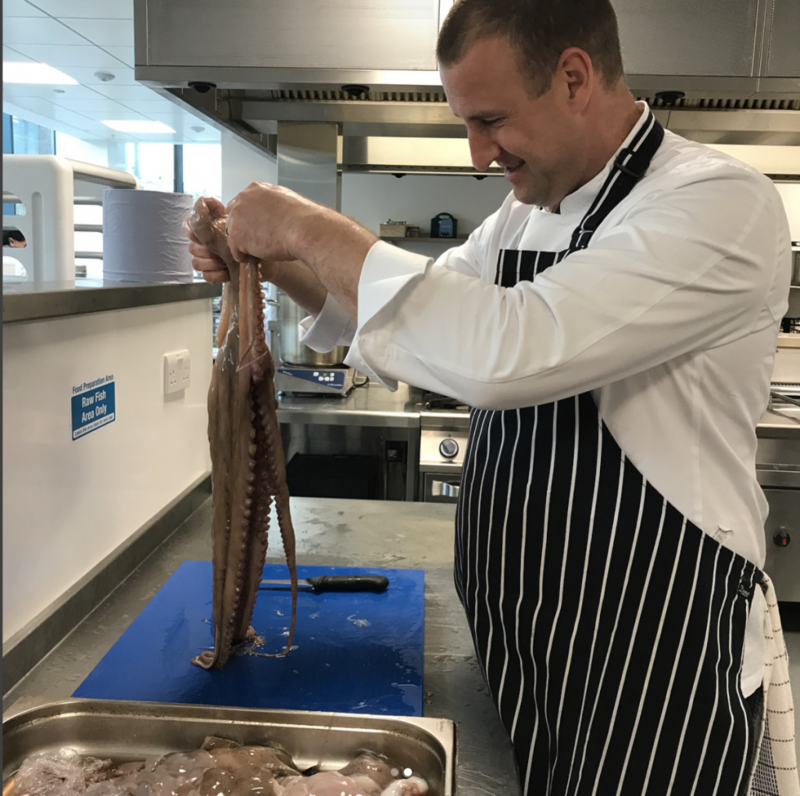 Head chef, Alan Harding gets to grips with a fishy problem. Mark Anderson says he has ‘the greatest job in the world’. ‘There’s lots more for us still to do at Gather & Gather,’ he remarks. ‘We want people to know that we produce great food and develop great people. That’s the legacy that I want myself and the chefs who work with me to leave behind.